Serene Snowflakes will probably show up on some of my Christmas cards. I'll post a holiday card using this set next week that we are making in our Stamp-a-Stack this Saturday. However, I bought this set because of the detail and versatility of the images. It would make beautiful background stamping for a scrapook page. This card features the largest of the snowflakes stamped in Versamark and embossed with some Ranger powder I had. I could have probably stamped in Bordering Blue Craft and embossed in white for a similar affect. Before stamping, I sponged the chipboard with Very Vanilla craft and then Ranger's Weather Wood on the edges. The center is my first build-a-brad. I love it! These are the pewter ones; the antique brass will be on an order very soon. Ingredients not listed above: Stamp Set: Serene Snowflakes, Define Your Life and One of a Kind (center of the brad) by Stampin' Up! Also Flourishes by Paper Studio. Not Quite Navy and Very Vanilla by Stampin' Up! 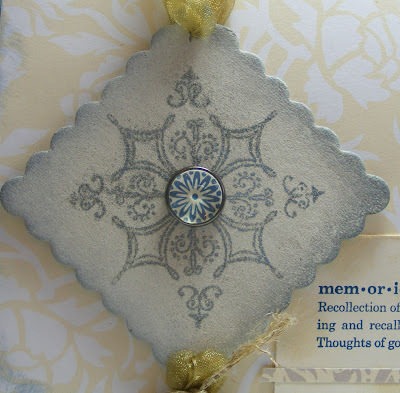 DSP is Bella Bleu by Stampin' Up! 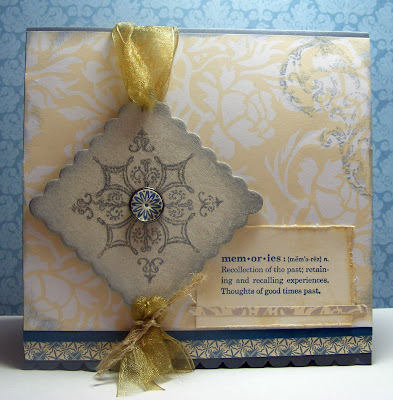 Ink: Not Quite Navy by Stampin' Up!